I don’t like to overprocess photos unless I deliberately want a sort of painterly look that may end up resembling something other than a photograph. For that, some of my favorite presents are in Topaz Labs’ Adjust. But for a photo that’s going to remain a photo and just wants that little something extra, I’m increasingly finding that Google’s Nik Viveza is a powerful yet minimalistic tool. Viveza has four basic settings: Brightness, Contrast, Saturation, and Structure. You can use the sliders to determine how much you want (or don’t want) of each of these parameters, and there is also a Brush Tool that allows you to select a particular feature in the image to which to apply your edit. A picture is worth a thousand words. So let me explain further using a few recently processed (or reprocessed) images. First I sometimes use Viveza to give an overall livelier tone to my image — a bit more “punch,”one might say. That’s what I’ve done to this image of the interior of the Higher Grounds Coffee Co. in Windham, and to this picture of Main Street in Phoenicia. Both towns are in the Catskill Mountains of New York. I did not amp up the saturation of the coffee shop interior to an unnatural level, by the way. Not my style. But as I said, Viveza’s Brush Tool is a very effective way to apply an edit to a selected part of a photograph. In these two images from the Mountain Top Historical Society’s campus in Haines Falls, I increased the structure and brushed the new setting onto the tree stump in the image on the left because I wanted the detail in the venerable old stump to stand in contrast to tne summer’s new greenery, which in places is ever so slightly blurred due to the breeze that was blowing that day. 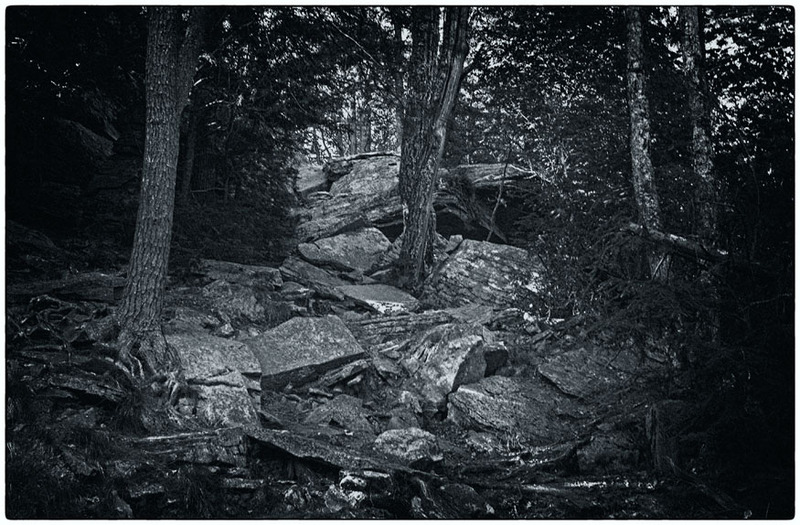 In the image on the right I increased the Brightness and Structure and brushed these onto the rock to draw the viewer’s attention to the rock. I did something similar with Motif no. 1 in this photo (below) of that famous building, ensuring that the enhanced Brightness and Structure would catch the viewer’s eye. If, like me, you want to give a bit of a “pop” to your photo without going overboard — something nice and subtle — I would recommend trying Nik Viveza 2. To learn more about Nik Viveza 2,click here to visit the website. To purchase any of my photos on the page, click the photo to get to my Fine Art America site. In late June Anton de Flon (check out his site — he is “the” Catskill Dude) and I went out to North-South Lake for a short hike. 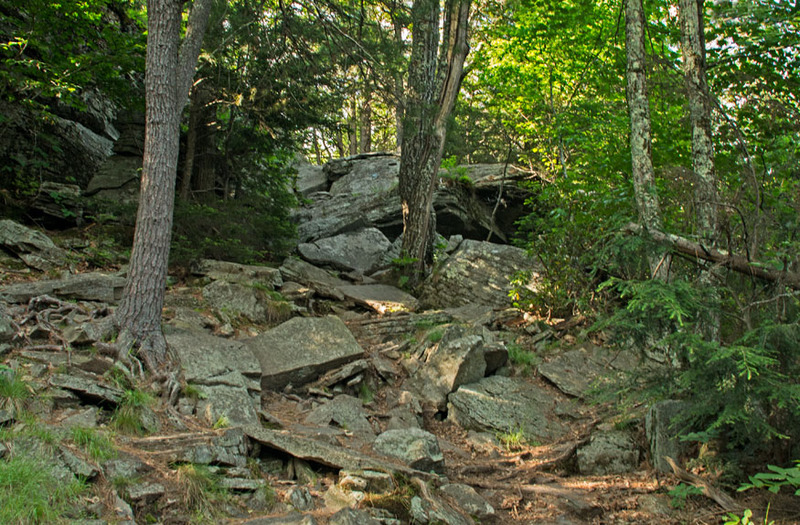 When we came to the point where the trail ascends these rocks, I decided to stop and take in the spirit of Hudson River painter Asher B. Durand, whose presence I sensed nearby. Asher loved to paint studies of rocks. Here is the original of the first picture I took. I wanted a vertical. Yes, it’s a bit far off, but that’s me — I like to begin zoomed out and then gradually move in closer. Same way I like to get to know people. 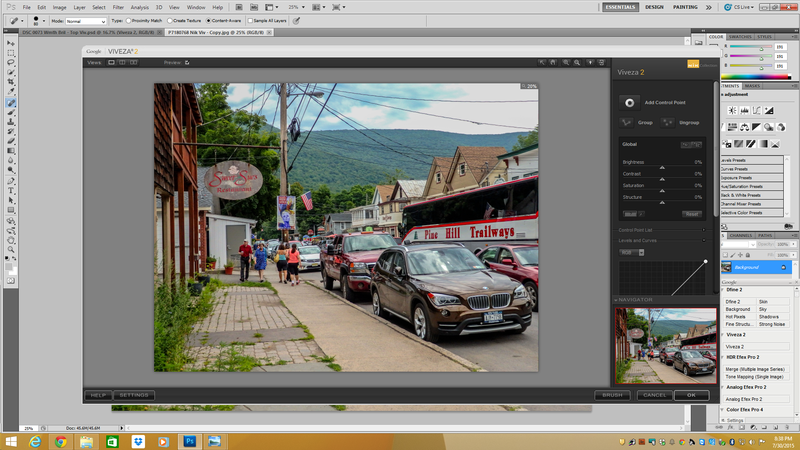 After some very basic processing in Lightroom, I took it into Photoshop to do the main work. 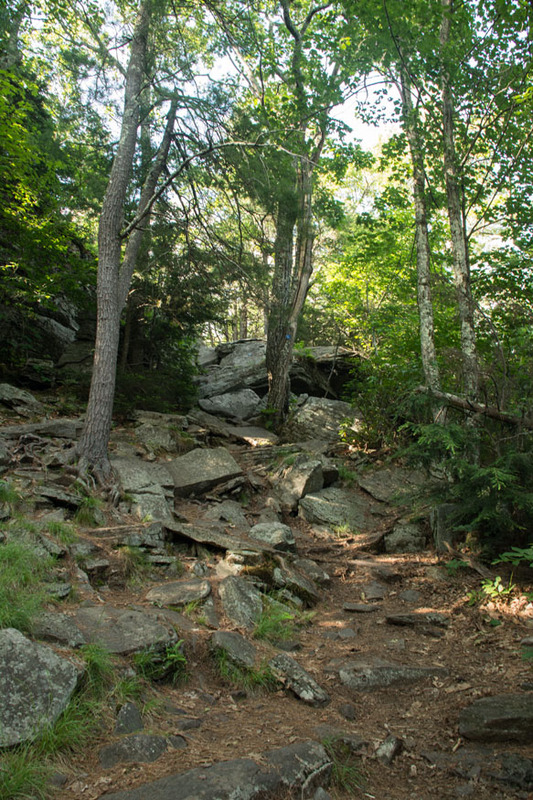 One of the first things I did was to zoom in to clone out one of those blue round trail markers. Then I looked at the zoomed-in picture and it struck me — Hey! I rather like that! Yes, I wanted a vertical, but I have at least three other verticals from that day, better compositions all of them, so … I cropped the image down to exactly what i saw on the screen, then lopped a tiny slice more off the bottom. It’s the one at the top of this post..
OK, but then what? Well, let’s see what Topaz Adjust 5 has to offer. Click, click, click on various presets — and then came the revelation. This one — called “French Countryside” — the problem was that leaving in all the details was making for too confused an image, and what it really needed was to be smoothed out. This one worked best for the purpose.